Mordecai Richler’s expertly detailed, often satiric portraits of the Montreal streets of his youth are among the richest aspects of his work. Books that revel in the wartime and postwar colour of St. Urbain and its neighbouring thoroughfares include The Apprenticeship of Duddy Kravitz, Son of a Smaller Hero, St. Urbain’s Horseman, andThe Street. 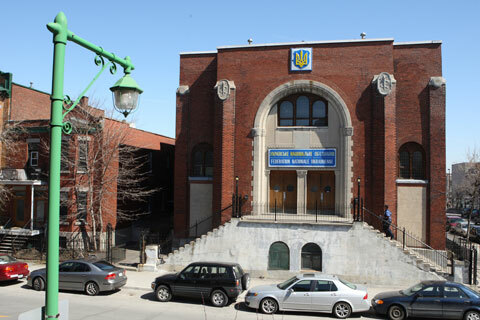 Though most of the Jewish community abandoned the neighbourhood in the postwar decades, a strong nostalgia and interest remains for the part of Montreal where Jewish life once thrived. One of the quirks of the place, based on long years (now past) of economic decline, is that the neighbourhood, with its characteristic architecture, remains remarkably intact. 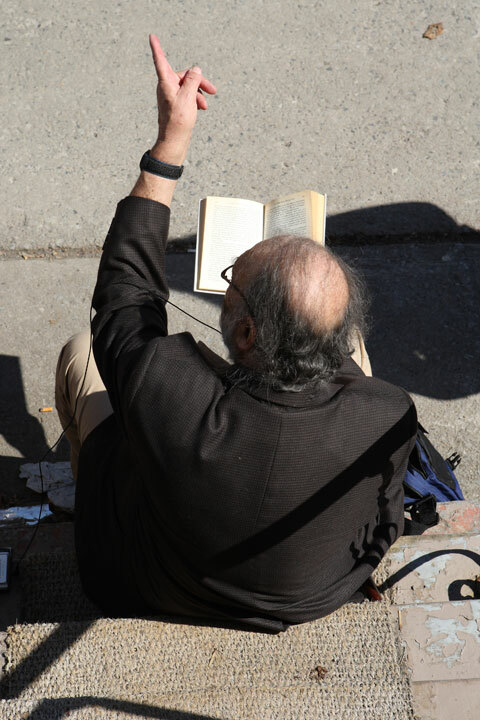 Walking tours of Richler’s Montreal have gained a following, and there is no better guide for such a tour than Stan Asher. A graduate of Richler’s alma mater, Baron Byng, a teacher and radio broadcaster, Asher brings a perfect balance of humour, lived and literary experience to a walk from St. Urbain, along Bernard, toward Outremont, the neighbourhood Richler satirized as the haunt of arriviste Jews with renovated rec rooms and encyclopedia sets for show. What follows are excerpts of a tour taken with Asher by this volume’s guest editors. The Special, how’s it made? You pay ten cents extra if you don’t want mustard on it because they have to make an independent decision. Now you see, if you don’t want mustard it’s got to be removed from the assembly line and that takes some independent thought, so that’s the reason for the special. As to what the special is made of, I think it’s different kinds of bologna and non-kosher meats slapped between two rolls. … Well let me just finish the story about Richler having the special. And he’s there having a special not communicating with anybody as far as I could see, certainly not with me, whom he didn’t know. Suddenly a guy came in, parked his Mercedes—double parked as they are wont to do here on a lunch hour as you’ll see. He came over and there was Richler having a special. And he clapped Richler on the back and said “Hey Moe Baby.” Of course nobody ever called him Moe Baby. “Remember me? You sat behind me in high school and copied all my English. Now, what are you? They say you’re very famous in Montreal. What are you—a filmmaker, musician or something? Well keep up the good work Moe Baby.” And he clapped him on the back again and left after having picked up his special. 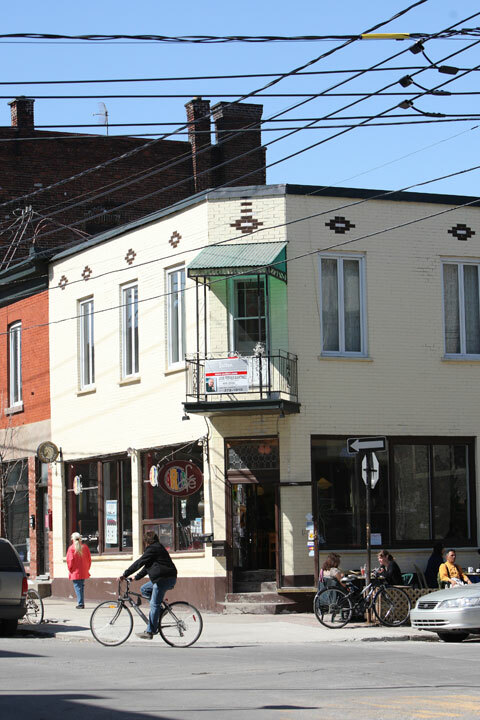 The original Wilensky’s, which goes back to 1932, was at the northwest corner of St. Urbain and Fairmount, a block from here. At some point later, the exact year I don’t know, probably in the sixties, they moved over here. So when the film was made it was using this as the setting for the story. Duddy Kravitz we’re talking about. And in fact for the occasion of the film they put chairs and tables in the space. There never were [chairs and tables]. It was just the saloon type thing with the booth. 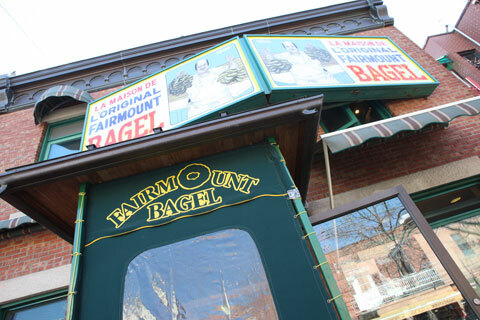 This was and still is the Fairmount bagel bakery. And where we’re leaning now was the window of the Christian Mission to the Jews. When I was in high school, from ’45 – ’49, around the time whenDuddy Kravitz is set, in the window was the New Testament in Hebrew with the word Yeshuah underlined. In Duddy Kravitz there is a story somewhere, I don’t know exactly where, near the beginning of the book, in which Duddy goes in here and gets the interest of the man who is running the place (whom I remember as a man named Mr. Rosedale who was actually a converted Jew named Rosenthal) and he [Duddy] says we would really like some pamphlets about Christianity because we have friends who are in the Orthodox school. We would like to show them about real Jesus. I’m paraphrasing the words. So they took these pamphlets and supposedly at least it says in the book, they stood outside what would have been one of the Jewish or Hebrew schools of the neighbourhood, and they gave them out to little Hasidic boys just to be malicious. So, shortly after that, when the people who ran the Christian Mission to the Jews realized that there wasn’t really much call for conversion because I don’t think Jews took to it all that well, they stopped it and then it reverted to the bagel bakery. So that’s basically the Duddy connection to this building. Now it’s a very chic place and gets attention. 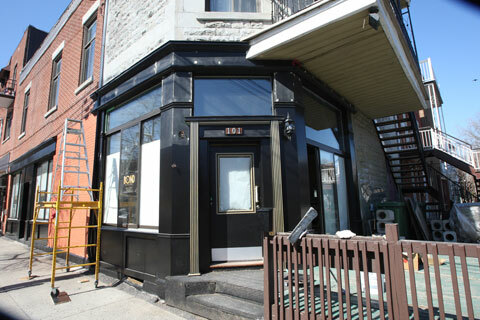 So 5257 St. Urbain was where Richler lived, I would say the first dozen or so years of his life. He may have moved later, I’m not quite sure. His parents, as you probably know, split after his birth and the story was that his father took a place somewhere across the street, exactly where I don’t know, so that they could keep an eye on each other. The house here is like a typical Montreal cold water flat. So there would be two bedrooms and I think Mordecai was the older brother and Avrum was the younger if I’m not mistaken. Is that correct? By a five or six year difference. Avrum is still alive, he lives in Corner Brook, Newfoundland I think or St. John’s, Newfoundland. I know people who go there on business and visit him all the time and bring him greetings from Montreal and maybe bagels for all I know. I suppose that the parents would have slept in what they call the double parlour, which would be as you walk in. The double parlour would have been a living room and maybe a curtain, because there was no actual separation, and a back bedroom. These houses are mostly, I don’t know the dates around here, from about 1900 – 1910. I don’t think it was a Jewish neighbourhood at the very beginning. I think that came later. I think it came more after the First World War, when the Jews moved up from where I was brought up around de Bullion Street. So that’s the layout of the house. If you want to see what a house layout of the type is I can take you later on to the radio station, which is built exactly like that. 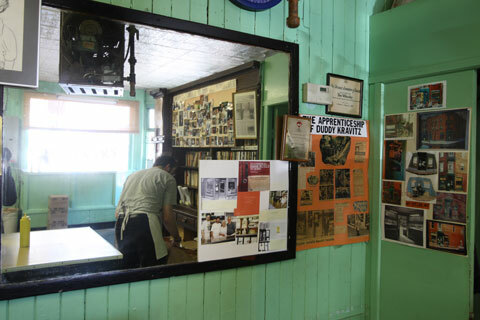 This was the original Wilensky’s from ’32 to maybe the fifties. We reached just about this point and suddenly a group of Hasidim came out of there. And I didn’t make the connection at first. 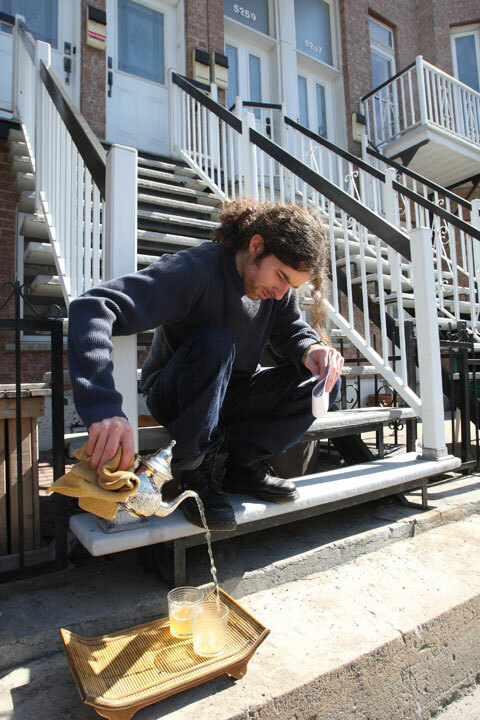 One of the Hasidim leaned against one of the poles at the corner here, on a Saturday afternoon, took out a Molson from his inside kapote, took out a cigarette, lit it and started to drink and said “Hi Stan.” And I realized he wasn’t Hasidic after all. He was a guy called Paul Hershon who was an actor that I once worked with in some film years ago. Anyway I didn’t speak to him, he just continued doing his thing, I did my thing. At that very moment—I’ll get to the Richler part soon—at that very moment the real Hasidim at two o’clock Saturday afternoon were coming out and they were on the other side of the street. They were about where the Collège Français is and this abomination was taking place on this side of the street and a little kid said in Yiddish “Mama gbn a kik, s’iz du einer fun undzere un er roichert shabos un er trinkt shabos.” I don’t know if I should translate or not. Asher: Alright, “he’s drinking and smoking on the Sabbath, he’s one of us.” The mother took the kid, covered his eyes with her hand, and went down the street. At that moment Mordecai came out of an adjacent building, and I looked around and I suddenly realized that this was being used as the set for Joshua Then and Now. Because then I noticed as we walked a block west—which we will in a moment to about where that took place—we saw him with a very early kind of cell phone, it was like a walkie talkie. 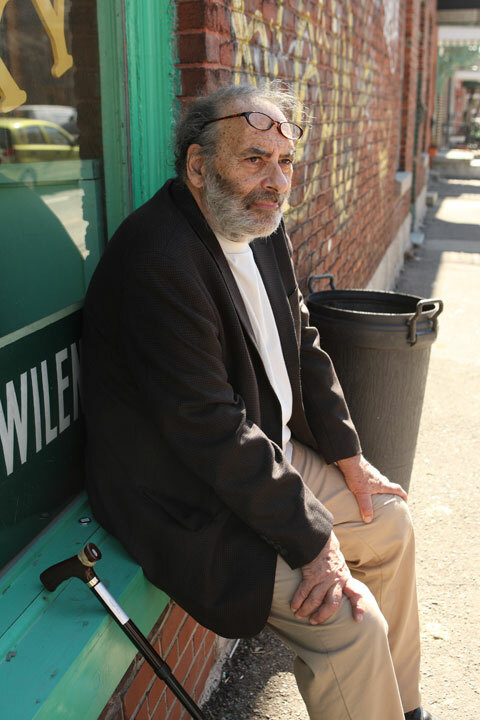 So he was doing something, he was yammering on the phone to somebody and I realized, as I looked around that there were push carts all along here, and some of the street names had been covered up in Yiddish. So, we’re now in Outremont. This is, by the way, the former Chevra Kadisha synagogue where they’ve removed, as everywhere else, the Ten Commandments from every building that used to be a synagogue. So here’s Richler, I’m quoting from St. Urbain Street Then and Now and Home Sweet Home: My Canadian Album. If you want to go to Baron Byng it’s 4251 St. Urbain. You can’t miss it. You go down St. Urbain and when you get between Marie Anne and Mount Royal, about six blocks south, Sun Youth, and you’re allowed to go in, and they don’t really mind, you can take pictures inside if you like. They won’t let you into classrooms because they’re being used to store furniture and things like that for the poor people. 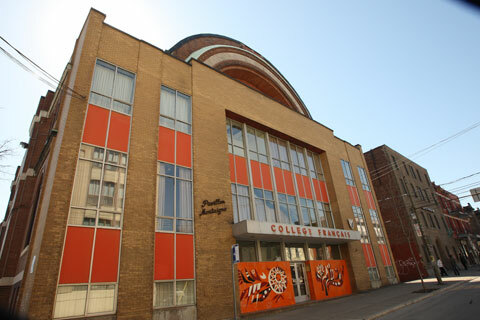 Well the exterior is exactly as it looked when Richler went to school, there’s been no change whatsoever. When I was there [at Baron Byng] and so was Mordecai and the people he writes about, the teachers that he gives fictional names to were as real and as close to their portrait as you could get by comparing, let’s say, what I knew about them and what he writes about them. For example, he has a teacher there who always drank and that was a teacher called McKennan. I remember that. Well he didn’t come into class drunk but he had medicinal things on his desk and one always suspected they weren’t medicinal. And the stories about him are pretty accurate, cruelly accurate. Then there was Lumas the physics teacher who was portrayed with another name. He was O.J. Lumus as in O.J. Simpson. O.J. stood for Oradel Johasavitz or something like that, a biblical name. We called him Jos. The reason for the Jos was that O.J. backwards spelled JO, JO is Joseph. Joseph is Jos among the Jewish kids. And he was profoundly deaf. I’m sure you probably remember the reference to him, to the deaf Physics teacher. He carried a huge hearing aid. In those days they didn’t have the little hearing aids like my cousin just bought. They got this big thing that looked like a short wave radio. It was an ear trumpet that was screwed in and of course, you got a guy like that in front of the room and you go a bunch of kids like Mordecai… So I must point out I never took part in it. I just watched in innocence. And then that’s in the book eh? Bender was a chemistry teacher, Baxter Garfield Spraklin—why do I remember these names? I don’t know—whom we called Barney for a reason that I have no idea. This was before the days of the Flintstones. I don’t know where he got the name Barney. And he would have been shell shocked in a World War I battle at Passchendaele or one of those places. And the reason he was still teaching high school was that some of the able-bodied teachers in 1945 had not yet come home from the war. So they were still hanging on to some of these other characters.